When we think about training with an e-collar, we typically envision situations of off leash control when we're outside with the dog. Off leash safety and reliability is one of the key reasons that I began to learn about e-collars back in the late nineties. Not only did I want to be able to feel more secure running my dogs in any environment, I wanted to be able to provide that security for my clients as well. 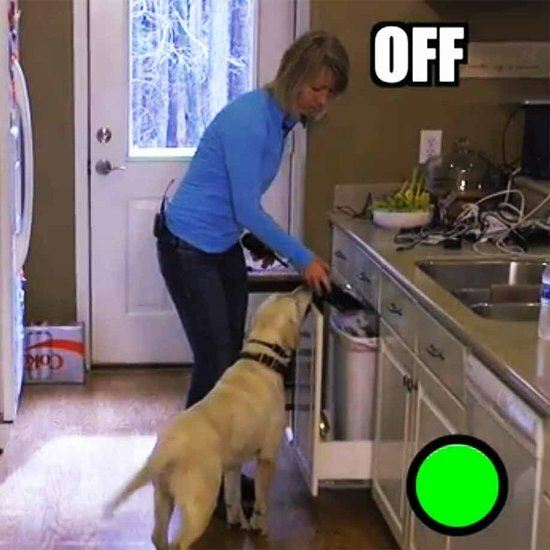 But it didn't take long for me to discover the many ways that e-collar training could also help teach the dog about having good manners around the house. Once I had some basic collar conditioning done, it became a relatively simple matter of using those skills inside to create a bit more clarity about what Fido's house rules where. Behaviors like door bolting or managing chaos when the door bell rang (See article: "Dogs and Doorbells -- Oh My!") were much easier to deal with. Problems with nuisance barking became a thing of the past, and stopping counter surfing and stealing food was relatively simple. When the e-collar skills where used inside and out, I found that my client's frustrations were melting away and they were actually enjoying their dog again. The e-collar wasn't magic and it took that initial work to condition the dog, but in comparison to all the other management techniques I had been teaching previously, this was a piece of cake! Take a look as I share a few tips on how to utilize your e-collar training to improve management around the house. Pull-Quote= E-collars aren't just for outside!